ISAT and Kinetics vibration isolation spring isolaters. There is NONE BETTER for Engineering services, manufacturing and testing capabilities - all backed by the industry’s most experienced staff. Highly effective for control of both high and low frequency vibration produced by fans and pumps located in floors. The model FDS can also be used in conjunction with wind or seismic restraint and installed outdoors. Operating static deflections are available up to 4" (102 mm) and with load capacities to 23,200 lbs. (10,523 kg) to compensate for long span flexible floor structures. 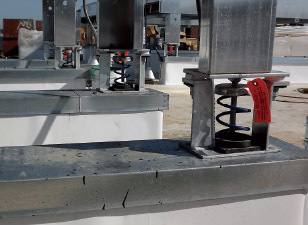 Vibration isolators for mechanical equipment, when the equipment to be isolated has significant changes of weight during maintenance operations, and for equipment subjected to external forces or high wind loads. 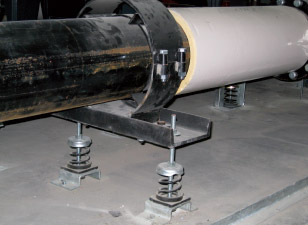 Operating static deflections are available up to 4" (102 mm) to compensate for long span flexible floor structures and maintain a high degree of noise and vibration isolation. 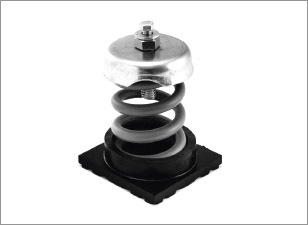 Some restrained spring isolators are designed to provide seismic restraint as well. Isolate vibration produced by equipment subject to weight change or external forces, such as air-cooled condensers, fans, and other rooftop equipment. Support of vertical pipe risers, where upright motion must be limited, yet the riser isolated from the building. Operating static deflections are available up to 2.00" (51 mm), in capacities of up to 3500 lbs. (1588 kg).